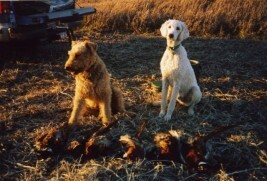 Standard Poodles were originally bred for water retrieval of birds, thus the reason for the show trim that is seen today in AKC conformation shows. It was not a 'pretty trim' but a functional trim which was done to allow the dog to move freely in the water, yet protect the vital organs and joints in the cold water. Drizzt is in the Continental show trim seen here, Drizzt himself is not a hunter but he is a therapy dog and visits nursing homes. 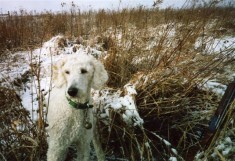 Today the Standard Poodle is still used as a retriever by some and is making a big comeback at field trials all over the US. Seger is seen here polishing his field skills. 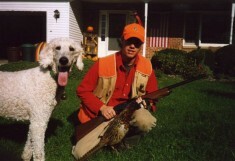 He is a beloved member of his family, yet this is no sissy dog. 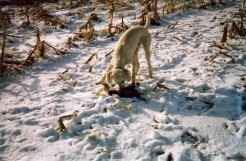 He hunts, he swims, and he follows the four-wheeler through the fields with the boys. MEN are you paying attention??? "Tucker" 2012 Destiny pup and his human dad! We recently attended a fund raiser for the Venango County Humane Society at Oil Creek State Park in Oil City, PA. At this point we do not compete in agility but have a good time running the course. The organizers asked Kayla to tell everyone about herself, her dog and about agility and asked her to run the course for everyone to see, we had a great time and raised money for a great cause! Jim even ran the course with Chauntae! up to meet and greet! one looking at mom taking the picture-mom get me outta here ! showed them how it is done in the musical chairs competition-way to go team!!! O'Kaylyn Farms First puppy Reunion 2013!!! We had a great time at our first "puppy" reunion!